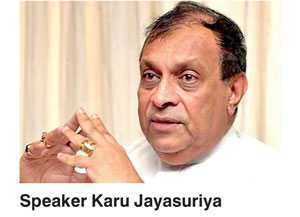 Speaker Jayasuriya had made no statement to the effect that such a request was made during a Party Leaders meeting. Consequently, the Speaker’s Office asserted that there was no valid reason to postpone Parliament sittings on these dates. Furthermore, the Speaker’s Office also denied media reports that Parliament would purchase 232 new chairs to replace those in the Parliament chambers. The statement pointed out that the chairs, equipment and apparatus in the chambers were of historical significance and that if they were to be repaired or replaced, it would be done in a careful and meticulous manner. However, the Speaker’s Office noted that an estimated 3,500 guests, including foreign dignitaries and school students, visit Parliament on a daily basis and that the roof, sewage system and bathroom facilities needed to be repaired and upgraded. This task would be carried out in a careful and transparent manner, the Speaker’s Office assured.